Love them or hate them, at some point every elementary school-age kid is going to have to learn sight words. For some advanced readers they come easily and quickly, but sometimes you have to get a little creative to help them learn. 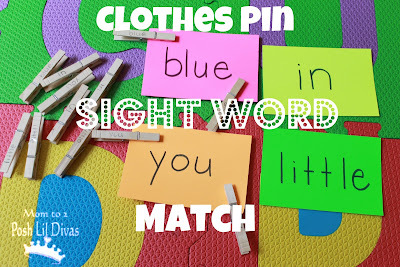 Today I am sharing a new way my son and I use to learn sight words and sharing some other tips and ideas. 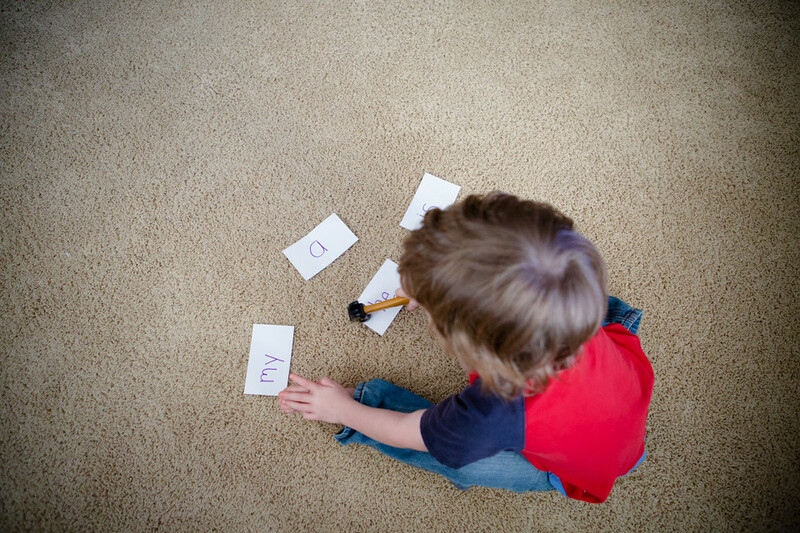 Write the sight words on index cards. I just did 4 words at a time, as he is just in pre-school. Then as you say the word, the child whacks or hits the right word. My son used one of his toy hammers. You could use a fly swatter, a princess wand, whatever your child likes. I would call out a word and he would whack it. I would switch up the order, and as he got better and would increase the speed a little bit. He really enjoyed doing this but thought it was even more fun, when he was in charge. He would whack the card and I had to say the words, very very quickly. He was hitting the words so fast when it was my turn, I am not sure how many he really was learning at that point, but it helped him totally enjoy the activity and he asked again several times to whack his words. 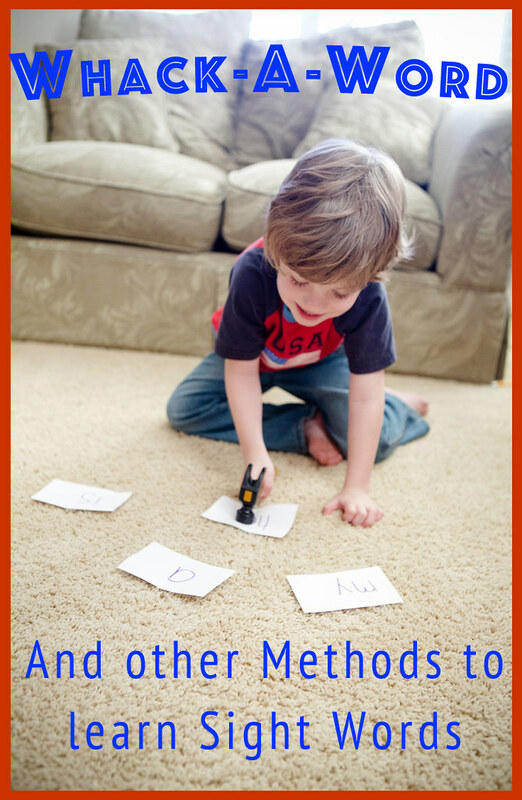 With sight words, consistency is the key. You need to be consistently working with your child, not just the night before the test. That is why I believe it is good to find some different ways to study the words, rather than doing the same thing every time. --Sight Word Race: Put Students in two teams and put a sight word up on a screen via PowerPoint. First person in line had to yell it out first and then the next kid would go. 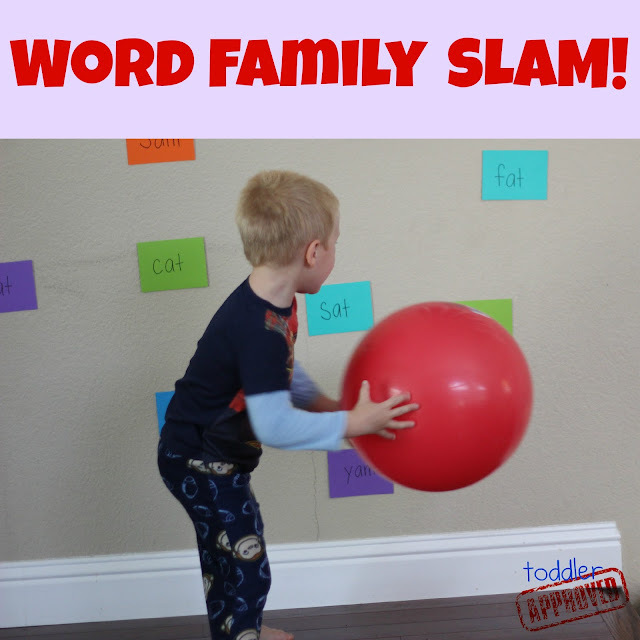 --Use Funny Voices: Teach the kids the words using silly voices, anything to make it more enjoyable. Shell of Things I Can't Say- also a former teacher said: Write out the letters of the alphabet with chalk (on the ground outside), then have the child jump from letter to letter to spell the common sight words. 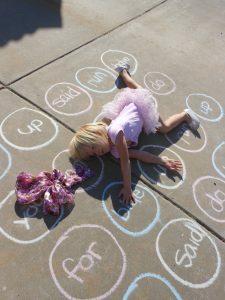 Or write the sight words on the ground with chalk, say the words and have them jump to the word and even share a rhyming word if they can. Here are a few more great ideas I found on-line. Click the title to take you to the original post and find out more information about each method. 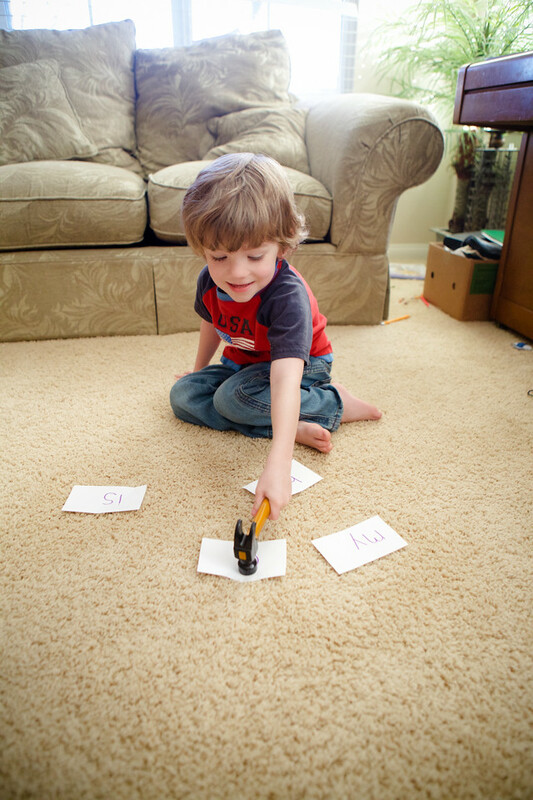 Do you have any tips or tricks that you use for teaching sight words? What a great idea. Cute photos too! He is a super cutie!! Good way to learn!! What a fun way to learn! 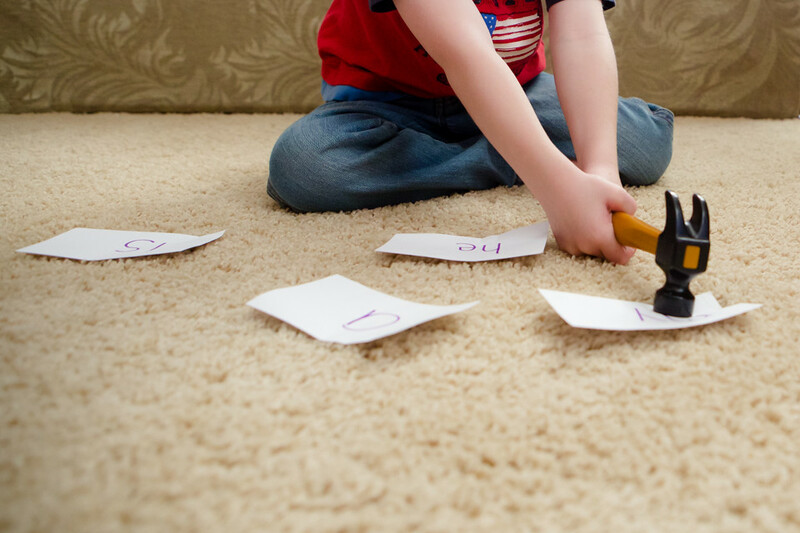 Little boys do love their hammers :). Your son is absolutely adorable. I love the twister idea also! Thank you! Yes, boys and hammers definitely seem to go together. Great ideas! I willl have to pass this along to my mommy friends! I love the pictures!!! Thank you so much and that would be awesome! oooh your hammer idea is a great one for my guys! All these ideas are lovely actually- gonna have to try that twister one out, too! Yes, I defiantly want to try the twister one too. That will be a great way to review when he knows more of the words, especially before he goes into kindergarten this fall! Eek! First of all, your son is ADORABLE. Secondly, what a fun, cool and creative idea! Definitely pinning this for sure and sharing! I like Whack a Word! Looks like he was having fun whacking away! That is an awesome idea, I know I'd have fun whacking the words! Found you on Best of the Blogosphere. I really love this! I home school, and I have a 5 year old girl who will like this. And, today was one of those bad days with an 8 year old boy and some times tables. I think 'Whack An Answer' may be on the docket for tomorrow! Thanks for a great idea! Nikki PS--I'm co-hosting a link party over on my blog. I'd love you to share on it! I like the parking lot one! They are all cute really. This post is just what I was looking for! 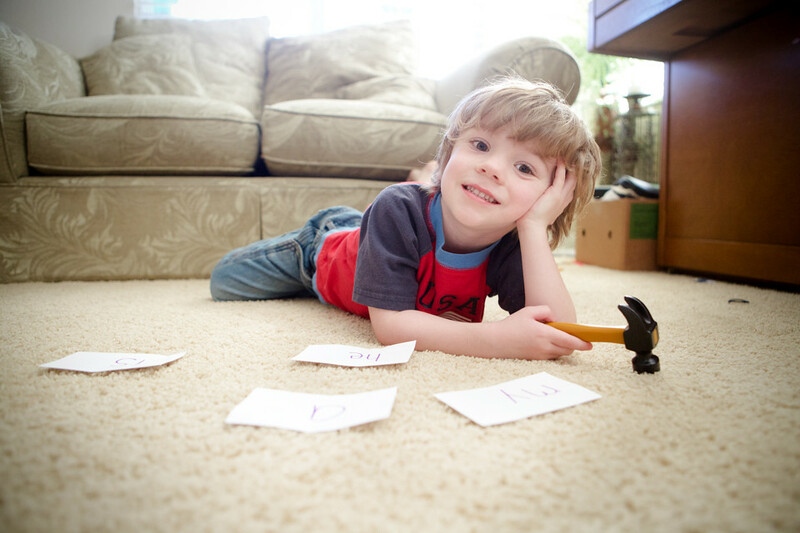 I've been looking for ideas to work on sight words with my son. Perfect timing. Thanks so much!